Shortwave from Miami Beach?! 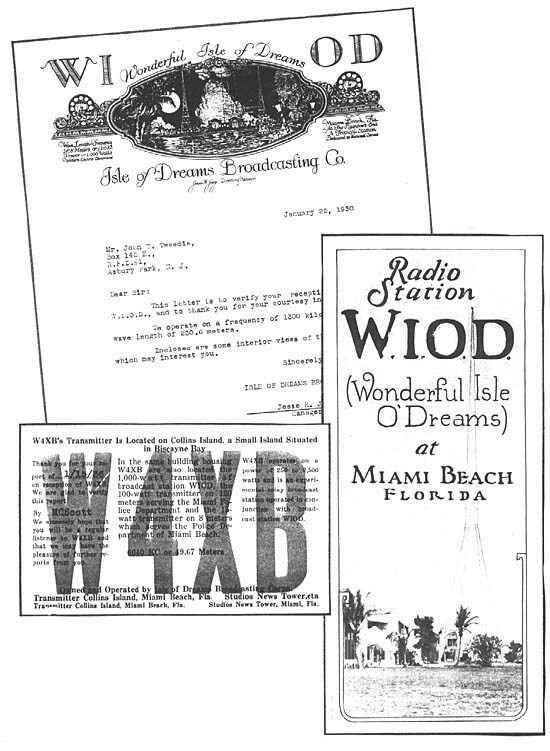 Station WIOD, "Wonderful Isle of Dreams," came on the air in the 1920's. Located on a small "island" near the city, the station's 1 kw. MW signal on 1300 kHz. was well known. But their reach extended even further when they put shortwave station W4XB, 6040 kHz., on the air in the early 1930's. It carried WIOD programs. In 1939, when the government replaced the experimental "X" calls for all U.S. shortwave stations, W4XB became WDJM. It left shortwave the next year when stations were required to either go to 50 kw. or close down, and its equipment was sold to WRUL.